University of Nevada Press, 9781943859498, 368pp. John Briscoe is a San Francisco poet, author, and lawyer. A noted wine and food writer, he is the author of Tadich Grill: The Story of San Francisco’s Oldest Restaurant. 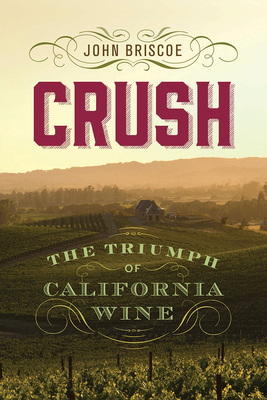 "Crush is a hopeful saga, with the forces of oenophilia winning out in the end as California wines enter the pantheon of the world’s fine wines. It’s a tale written with panache and wry opinions, and is a smooth introduction to five centuries of California history, as seen through the curved lens of a wine glass." "essential history for wine aficionados." ...this book is a compelling read fashioned with a skilled writer's ability to weave facts and colorful tales into an epic story. "Delivers a comprehensive history and fascinating read; it is a true celebration of the persistence of the California vignerons throughout the ages, their battles with adversity to make the region's wines some of the best in the world today. Highly recommended!" "The history in this book pops right off the page...For those who are passionate about food culture in America or the history of California, the character and detail in this book is something that can’t be missed." "...an impressive compendium of research..."